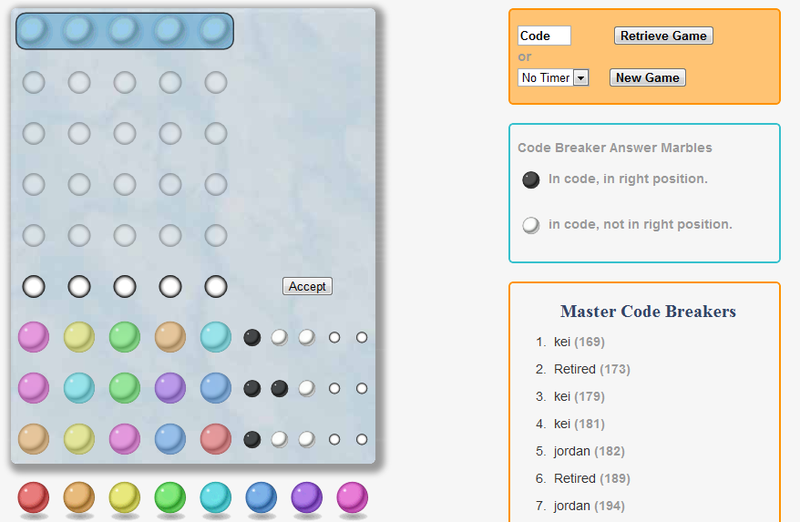 Codebreaker is an online logic game that allows the player to guess a correct color combination “code.” In each guess (represented by the rows of circles in the leftmost part of the diagram), the computer places black circles in smaller pegs (see circles below the Accept button in the diagram) to indicate the number of colors in the right position, and white circles to indicate the number of correct colors in the wrong position. The player is allowed up to eight guesses to win the game, otherwise he loses. The Codebreaker Game is very similar to Mastermind, a well-known board invented by Mordecai Meirowitz. It’s a good game for developing critical thinking of students. A good activity would be to let students develop their own strategy of making the least number of guesses in breaking the code.